The feature, which has launched today in beta, is included in both the Spotify for Artists, and Spotify Analytics toolsets. Anyone with access to these services will be able to choose one unreleased song from a release to submit. 2. Find your unreleased music at the top of the ‘Home’ or ‘Profile’ tabs. 3. Select ‘GET STARTED’ next to to the release, or go to ‘Profile’, then right-click any unreleased music, and select ‘Submit a Song’. 4. Choose a song from the release to submit. 5. 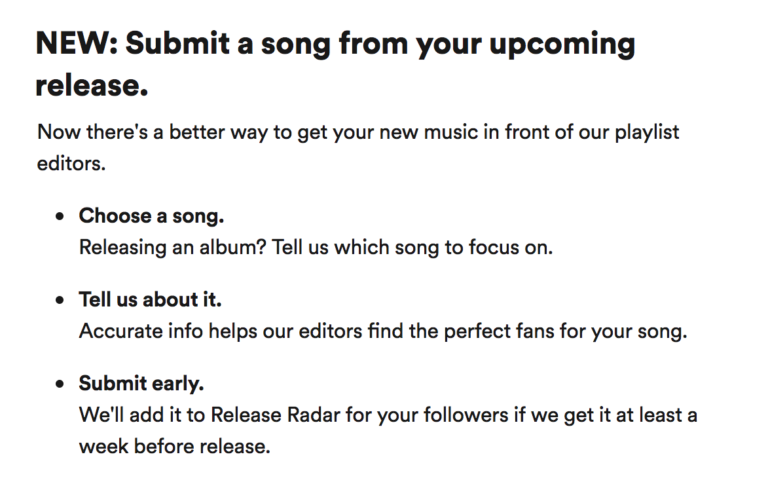 Fill out as much information as possible – the more information Spotify receive, the better chance the music has of being considered.